Something we get asked about quite often is how we plan for and prepare meals for multi-day trips, whether it’s for backpacking or canoeing. Without a doubt, this is one of the most important and time consuming aspects of backcountry trips, in my opinion. You certainly do not want to bring along too little food and end up hungry all the time, but by the same token, you don’t want to end up bringing too much food and having to pack it with all its associated extra weight. Obviously if you’re canoeing, that is not the same consideration since you don’t usually have to carry your food around on your back. Except perhaps when portaging. We want to get one thing out right away; we’re not minimalist food people. We don’t know how many stories and blogs we’ve read about people carrying large bags of gorp and living for days on end on a few pounds of food. That may be fine for some but we want to actually enjoy a meal at the end of the day. On one or two night trips, we will sometimes only bring cold food, but we need variety and often our ‘cold’ meals will be a mix of trail mix, sausage such as landjaeger, and a variety of energy and fruit bars. Power to the people who can live off of a bag of nuts and fruit for a week but we’re not those people. The first step is fairly obvious; are we planning for backpacking or canoeing? And if we’re canoeing, will we be able to have a fire to cook on? Let’s start with canoeing. To a certain point, you can kind of treat canoe trips like a car camping trip. Usually you can afford to bring more weight along and in some cases, you can even bring a cooler. In fact, for a five day trip to Murtle Lake, we were able to bring a cooler and enjoy steak, chicken, eggs, and more. It was backcountry luxury only made better by cold beer in the evenings! We did bring along a Coleman stove for some cooking and making hot water, but we also knew that we would be able to make a cook fire each night, so we planned around that. We love cooking on an open fire and since most firepits you will find in BC parks have a grill, it’s quite easy to do. If you have a fire ring, you may have to rig something up, but that generally isn’t very difficult to do. Bring some tinfoil and butter along, it’s a simple matter to grill a variety of vegetables alongside your favourite meat and have a great meal that is well deserved after a long day of paddling. Of course if the weather is bad, cooking on a fire becomes a bit more complicated. That said, we have managed to cook on an open fire under some pretty adverse conditions including some of the heaviest rains we have been seen while camping in Utah. Generally speaking, on canoe trips we will cook both breakfast and dinner. Lunches on the other hand, are usually things that require little or no preparation, such as sausage, vegetables, fruits, sandwiches, and so on. When we feel like having lunch, we’ll just pull over at a convenient point and break out the food. Quick and easy. Breakfast may or may not be complicated and if we want to save time, we’ll just bring along something like oatmeal that prepares quickly and easily. Most of the time while canoeing, we will bring ‘real’ oatmeal and not the quick style in which you just add hot water. Snacks are something else we bring along and can be pretty well any manner of food you wish. We prefer high energy snacks such as bars and the like in order to keep fueled up as even paddling can burn a lot of calories, particularly if you are fighting the wind a lot and have to paddle hard. Backpacking is a whole different thing for planning especially since you will be carrying everything you plan to eat for days. The good thing about that is that your pack will gradually become lighter as the days go by. A general rule of thumb is that you will have 2-3 pounds of food per day but that can add up quite a bit. I believe that when we did the Skyline Trail near Jasper on a four day trip, I started with 15 pounds of food. That is a substantial part of weight to account for. Not to mention size and shape, all of which you must consider when loading your pack. Often we work on a two meal principal while backpacking; breakfast and dinner. Lunch will be cold and be whatever we feel like having and usually works out to be things like jerky, trail mix, and energy bars or dried fruit. Most times now, we will also bring things along like bagels and buns as they are nice to have breakfasts or lunches. A bit heavy and bulky, yes, but worth it. 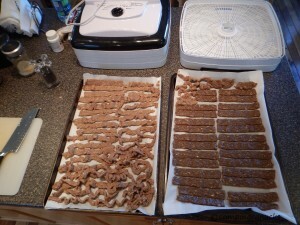 Much of our meal preparation goes into dehydrating and packing dinners. There was a time in which we just bought the ready to eat meals from outdoors stores but for the most part, we now make our dinners, with many of our ideas coming from a great book called The Complete Trail Food Cookbook. Within this book is a wealth of great meals and snacks that lend themselves to great meals when backpacking, or canoeing for that matter. This book is also a great source for information on dehydrating pretty well anything and over the years we have done beef, chicken, vegetables, and a lot of different fruits. Currently we are using a Nesco four tier dehydrator for drying our food. A word of advice; if you do plan to dry onions or garlic, follow their tip and do it in your garage. Our house smelled like garlic and onions for days after we dried them in the kitchen instead of in the garage. Among our favourites are different flavoured beef and chicken jerkies, bananas, apples, and pastas. Meals we have found that work well are things like hamburger based meals such as spaghetti sauce, stroganoff, and chili. Among the things we found did not work was ground turkey chili as the turkey turned into hard little chunks of meat that did not make for good eating. When drying your own meals, it does take a bit of experimentation to determine what works and what doesn’t. Most of the items we made out of the book turned out fine but sometimes we found a meal was too bland or something and we would need to make an adjustment the next time. In some cases, we found the amount of food a dried meal would make wasn’t enough and that we would have to increase the ingredients for the next time. We like to make a list of the days and meals that we are going to need before we start to get anything underway. Here is an example of our five day trip to Mount Assiniboine. Five days of food. The beer didn’t go along. All of our dinners were meals we prepared at home. For backpacking trips, we will bring instant oatmeal, although we prefer the unsweetened kind and add dried fruit to it for more flavour. We will also often grab some of the jams and peanut butter packets served in restaurants and bring those along for buns and bagels. On this trip, we also just happened to bring along a couple of store bought meals just in case some our new meals didn’t work out. That turned out well as we found that we had time for hot lunches a couple of days when the weather was bad or we finished day hiking early. In the end, we ate almost everything we brought along. Since many of our dinners are several parts, such as chili and rice, they do require more prep time and cooking, and inevitably, more fuel. That means carrying more fuel but the trade-off we find is that our meals are always lighter than store packages and usually easier to pack since we can package them in small ziploc baggies. We will then split the meals and ingredients between us. We’ve also found that bringing along your own meals makes for good conversation with fellow backpackers as they are often interested in what you are having and how you went about making it. 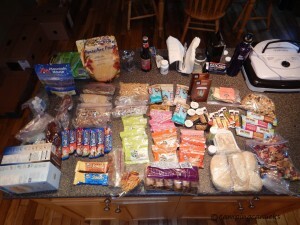 In the end, meal planning is definitely one of the trickiest parts of backcountry travel. Most everything else we will bring along is static; tent, clothes, pads, bags, etc but meals are always the wildcard that will affect how much weight you have and how you pack it. Or you can just carry a pound of gorp for each day on the trail to make it light and easy.